MADISON, Wis. -- A federal judge on Friday blocked President Trump’s administration from enforcing his new travel ban against a Syrian family looking to escape their war-torn homeland by fleeing to Wisconsin. The ruling likely is the first by a judge since Mr. Trump issued a revised travel ban on Monday, according to a spokesman for the Washington state attorney general, who has led states challenging the ban. A Syrian Muslim man who was granted asylum and settled in Wisconsin has been working since last year to win U.S. government approval for his wife and 3-year-old daughter to leave the devastated city of Aleppo and join him here. The man, who is not identified because of fears for his family’s safety, filed a federal lawsuit in Madison in February alleging Mr. Trump’s first travel ban had wrongly stopped the visa process for his family. U.S. District Judge William Conley set that challenge aside after a federal judge in Washington state blocked the entire Trump travel order. 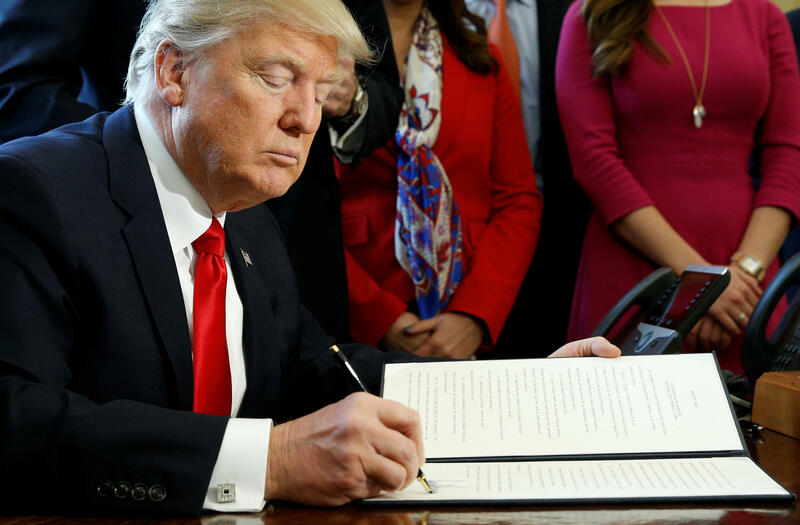 Mr. Trump signed a new executive order on Monday. The Syrian man filed a new complaint on Friday afternoon, alleging the new order is still an anti-Muslim ban that violates his freedom of religion and right to due process. He asked Conley to block its enforcement against his family. Judge Conley granted that request, saying there were daily threats to the Syrian man’s wife and child that could cause “irreparable harm.” He issued a temporary restraining order barring enforcement against the family. The order doesn’t block the entire travel ban. It simply prevents Mr. Trump’s administration from enforcing it against this family pending a March 21 hearing. After the Trump ban was blocked the first time, the approval process restarted for the Syrian family and they’re now preparing to travel to Jordan for visa interviews at the U.S. Embassy, the last step before U.S. customs officials decide whether to issue them visas. But the family doesn’t have dates for the interviews yet and Mr. Trump’s new travel ban goes into effect March 16, stirring fears that the process could halt again before visas are issued, according to the Syrian man’s attorneys. Mr. Trump issued an executive order in January banning travelers from seven predominantly Muslim countries, including Syria, from entering the United States. U.S. District Judge James Robart in Washington state blocked the entire order on Feb. 3. The revised order issued Monday removed Iraq from the list of countries and would temporarily shut down the refugee program. Unlike the first order, the new ban would not affect current visa holders and removes language that would give priority to religious minorities. Hawaii filed a lawsuit challenging the new ban Wednesday; other states with Democratic attorneys general plan to sue next week. Will Trump's revised travel ban face legal challenges? Meanwhile, hundreds of U.S. refugees have illegally entered Canada since Mr. Trump’s first immigration order, CBS News correspondent Jericka Duncan reports. U.S. refugees who cross at an unguarded part of the border are arrested, but once on Canadian soil, they are allowed to claim asylum. At an official border crossing they would be turned away.